With cheeks softer than a bird’s down. Her face works into a limpid gaze..
And then into a red-faced frown. Brought my own child so much pain? But I feel motherhood all over again. That she would herself produce a precious Another. Pain and worry are slowly past. I can still succumb to this baby’s charms. When that walk is without a friend? Seems tiring and without an end. When friends have to stay apart? But the tears are in the heart. Of not being able to meet? To the time of meeting…achingly sweet. For the distant friend’s touch? One misses the other…so much. This is for two friends who are forced to live on different continents. With all my love. Thank you, Das, for sending this to me! Since the hospital was not ready to take in A as rooms were not free, I went off (with KM) to Forest Park for a long walk, and to see the five (yes, five!) 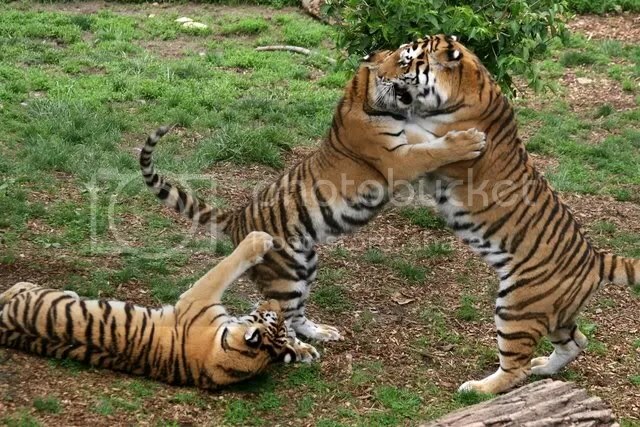 Siberian tiger cubs that celebrated their first birthday yesterday. The big cat breeding program has been very successful in St Louis Zoo; I have already written about their success at breeding cheetahs. 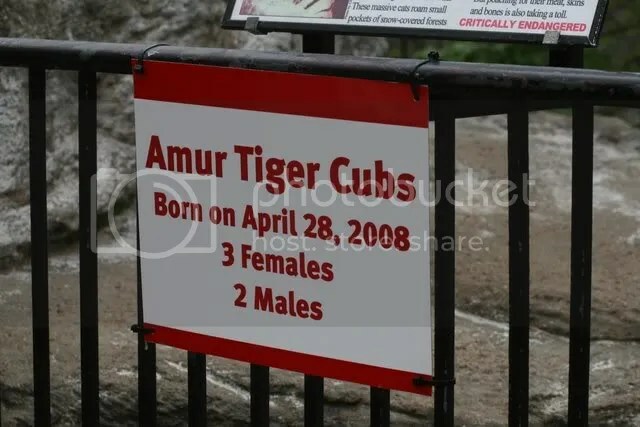 Well, the Siberian or Amur Tiger is a critically endangered animal, and the Zoo has successfully been able to breed five cubs! And a birthday (whether of my GD or of Amur Tigers) is no small affair, so it was lovely to be able to see them…. 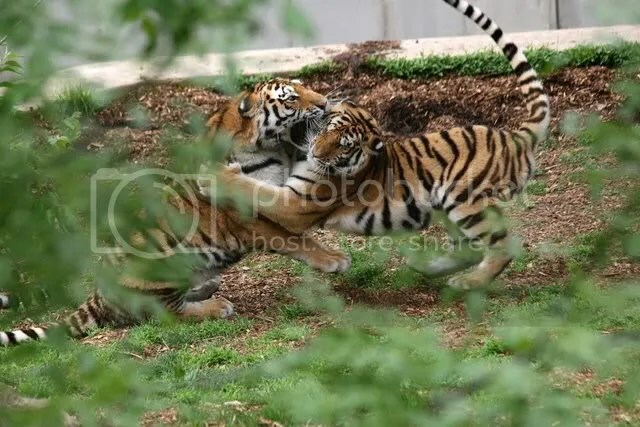 The tigers are nearly the size of their mother! But their baby fat and their mischief identifies them. How playful children are, no matter where and what they are! c. A no-poop no-pee policy…. The hospital is very accomodative of families; both KM and I have spent the entire day here and will return home only after dinner; we will have a good night’s sleep, and get back to the hospital tomorrow after the day’s chores are finished. Only A’s food (as the “patient”) would be free, we’d have to pay for our food, we realized…and we didn’t know what the food would taste like, so we packed our lunches yesterday….KM and I, being good TamBrams, each took along a 6 inch Sub.. and our white American son-in-law…packed curds and rice and mango pickle, and beans sabji! In the event, the food in the cafeteria is pretty good…I liked the salad and the soup, and KM had a chicken sandwich and salad, too. My room no. when I had A was 315; A’s room no. when she’s had her daughter (it’s most probably going to be Lalitha, but there’s still a little doubt) is…351. There’s wifi in the hospital, so naturally, it doesn’t work in the room, and I am sitting outside in the corridor typing this and getting the nurses to do something about the fact that we can’t get the internet on the other side of the door! Hundreds of messages are pouring in, sharing our joy; at least on LJ…each of you, do take this as my personal thank you….we are all exhausted, and getting to write individual thanks is, I think, going to be impossible. ALL newborns usually look like Wrinkled Prune Martians. So I am still surprised to see that TLO (The Little One) or GD is quite a chubby creature, and ACTUALLY looks like a baby! 3.5 kg is quite a birth weight. She does NOT have a teeny-weeny little voice, either. She yells! There is NO doubt about when she is not happy! She has existed in the outside world for about 6 hours now, and my goodness, there is NOTHING wrong with her lungs. She’s already tried hard to fasten her goldfishy mouth on various parts of my jacket arm….until she went to her mother. I call her “eli”…or “mouse” in Tamizh, as A wanted to call her Ellora (meaning,cloud) and at that time, the baby-in-the-tum WAS the size of a mouse, too! And what an appropriate nickname for a baby born in the time of the Internet! She’s been Eli to me for quite a while now, so the nickname comes naturally to my lips as I talk to her and croon at her. 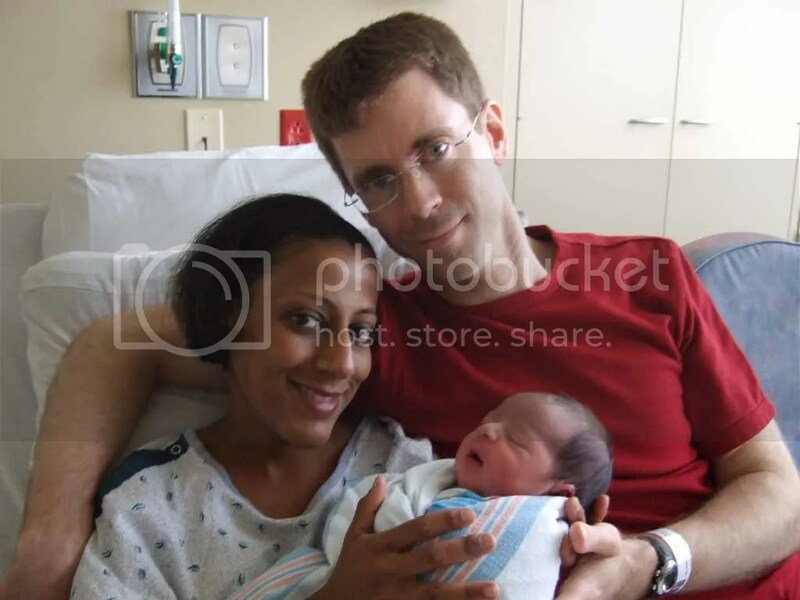 Because the birthing room had internet access, and because of Skype, D’s parents (in Maine) and N (in Chennai) were able to see Eli immediately…I cannot stop marvelling at the wonders of technology. D has downloaded the pictures we took, and will be sending them when he can…but WHEN we get internet inside! Off now to go inside…let’s hope they get someone to sort out the internet problem…. She’s got a nice cap of dark..perhaps black…hair. LARGE eyes. The right number of everything outside, and inside, I hope. I want her to read this one day…. D’s parents and A’s aunt were able to see the baby, parents, and grandparents due to Skype video! I was up at 5 am, getting ready so that we could leave for the hospital by 6.30 am (there’s always that last-minute rush for the hot water!) and at 5.30 am, we get a call from the hospital, saying that many women came into the hospital in a state of advanced labour, so elective procedures like inducement of labour had been postponed…so DnA will probably get a call only this evening or tomorrow morning (more likely). All dressed and nowhere to go…DnA went right back to sleep but me, the insomniac…I went for a nice long walk! It was neither rain nor even what we call a drizzle in India, but what is called a “fine Scotch mist”….when one can feel the moisture on one’s face, but can’t really feel the raindrops. It was a beautiful walk, and I came back with chilled hands and face (oh, it’s been cloudy and cool here for the past 2 days, back from the HOT weather of Sunday), made myself some HOT coffee (which will not bear any comparison to the Park View baitu coffee) and wanted to have a nap, but meanwhile, I had to update D’s parents, and itsalouwelylife, too…. So..no nap; but on the walk, I got the New York Times, and the St Louis Dispatch, and learnt from the latter newspaper that there are now five AMUR TIGERS which are exactly one year old today, at the St Louis Zoo …since I seem to have a bonus day today, off I am going! 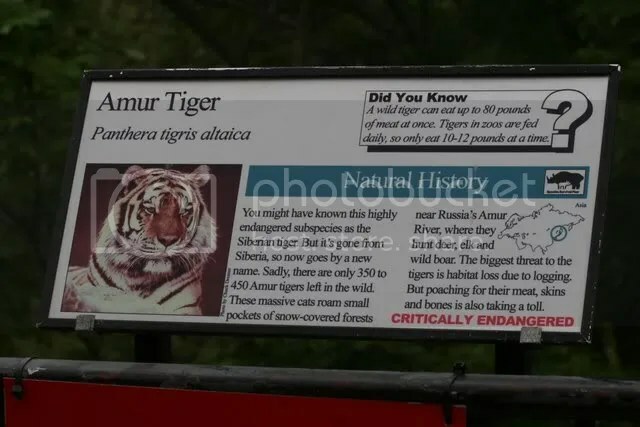 Here are the details about the Amur Tigers . 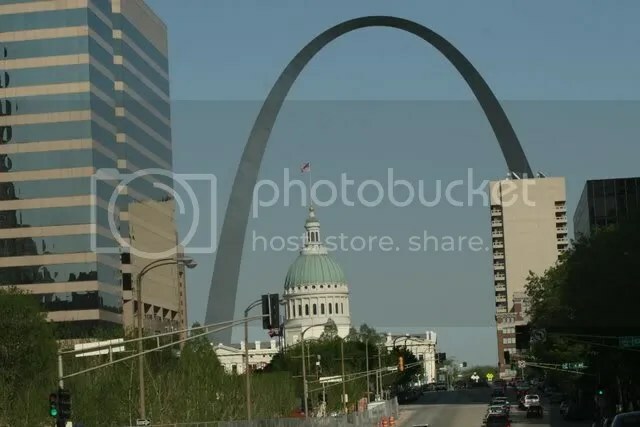 Meanwhile, here are a few images of the Gateway Arch , the iconic structure of this city…. You are currently browsing the Deponti to the world blog archives for April, 2009.